Driving into work this morning I am obsessing about my dwindling (although slowly) debt and feeling very grateful to the Lord for tending to all my material needs. 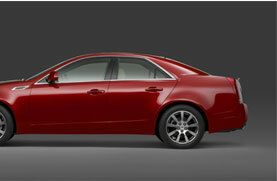 I’m thinking about the lilies of the field and the swallows of the air¹ when here comes a CADILLAC CTS. RED…Crystal Red. You know the one. It’s resting on meaty haunches, ready to pounce on my unsuspecting Nissan. And I’m rooting for the CTS! Trusty Nissan be damned! I roll my window down, hoping to hear the engine, but the driver is not an engine revving kind of girl. Tragic waste. Suddenly, I am weak in the knees. WEAK IN THE KNEES!! And I’m thinking, “come on…open it up…let’s see what you can do…” Then I start to get the whole men and strippers thing. I wanna see IT ALL! There are no more lilies on my brain, just 6 pounding cylinders and a leather wrapped steering wheel. This hunk of throbbing American metal is begging me to save it from the mundane suburban traffic and run it through the twisting canyon just miles away. Never mind national security and environmental implications, the true tragedy of our current energy crisis is the demise of the drive. At $4.00/gallon, it is a rare treat to open the throttle and feel my car’s power surge into the empty lane next to me. And an aggressive drive through the canyon? Sadly put on hold as I “conserve” the liquid gold for trips to Super Target. Where’s the joy? Actually, it’s probably not in the Cadillac. Amazing how, despite so many efforts to avoid materialism and count my MANY blessinge (even that trusty Nissan I sold down the river), I am quickly taken from a state of gratitude to a state of dissatisfaction. In a mere moment, I question every choice I’ve made and rue the dull life I have chosen to lead. Sad what a little chrome can do to steal the luster from true joy. With beautiful, healthy, warm, educated and well-fed daughters and a husband and countless friends I have no right to want for more.